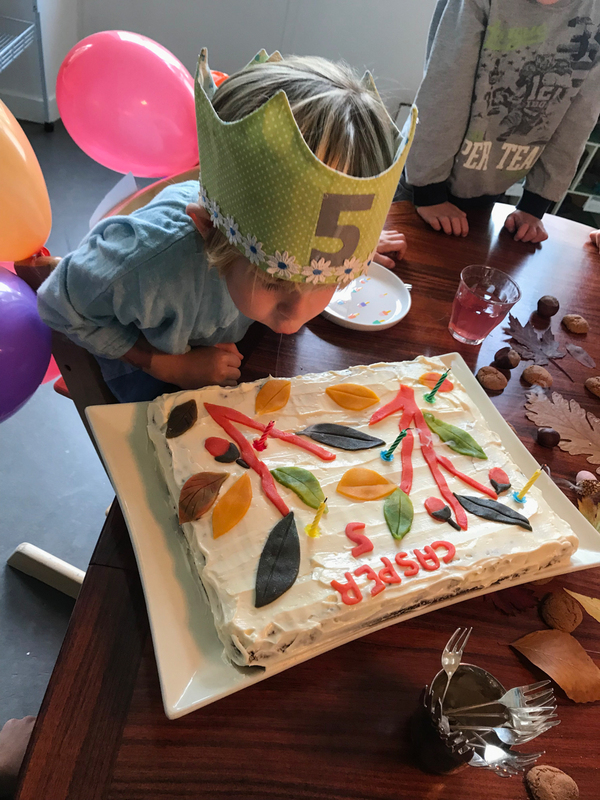 Casper recently turned five, and since he is an October baby we decided to do something seasonal for his ‘friends party’. 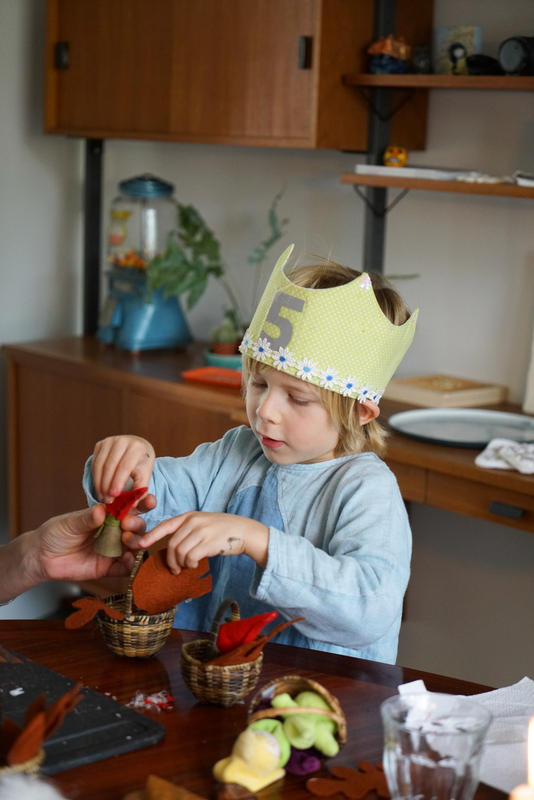 According to family tradition, he invited 5 friends (since he turned 5 years old), and he did so by handing out his invites, which we decorated with a cute painted leaf. 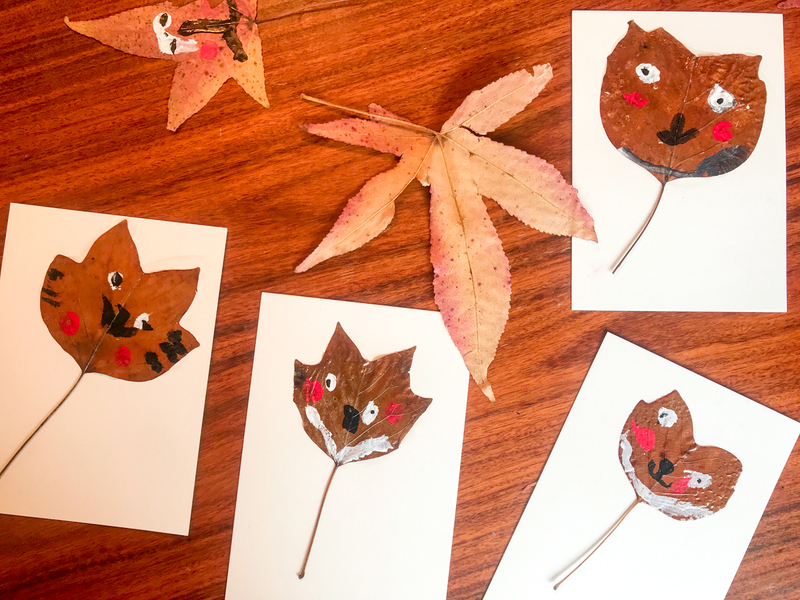 Collecting the leaves, drying and consequently painting them was a fun and sweet activity by itself, and something we all enjoyed. 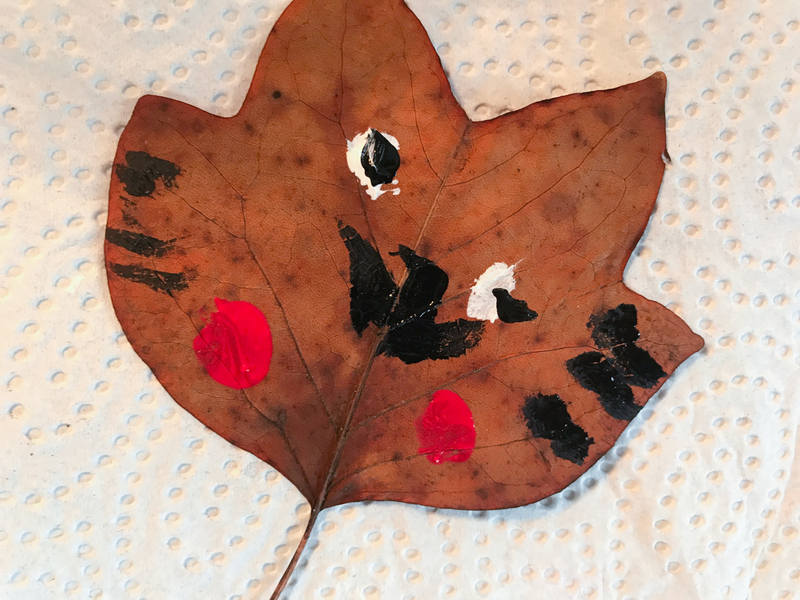 (The other children of course got inspired as well so we’ve had tons of cute painted leaves decorating our walls and table ever since.) It is important to make sure the leaves are properly dried. I usually stick them between the pages of a heavy book and leave it all to dry in a warm place for a week or so. For the paint, acrylic paint works best, and the glossing and glueing is done with either Mod Podge or Décopatch. 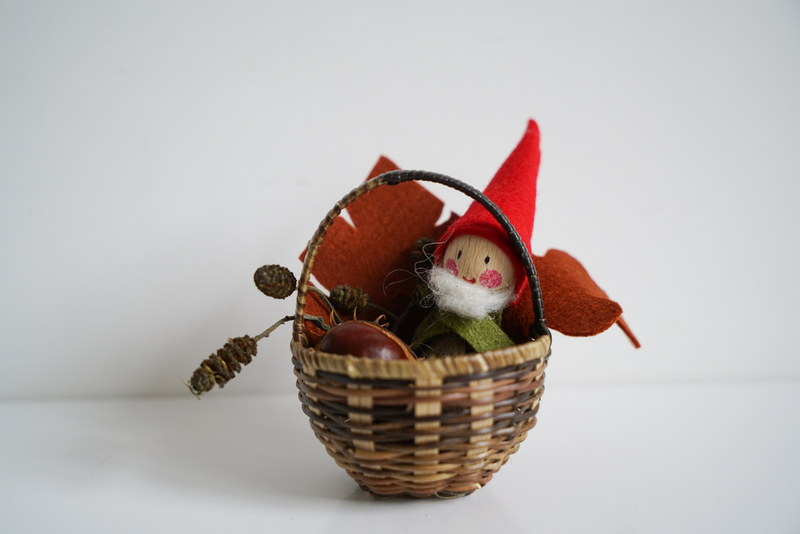 Autumn is all about leaves and nuts and mushrooms, and to me little gnomes as well. 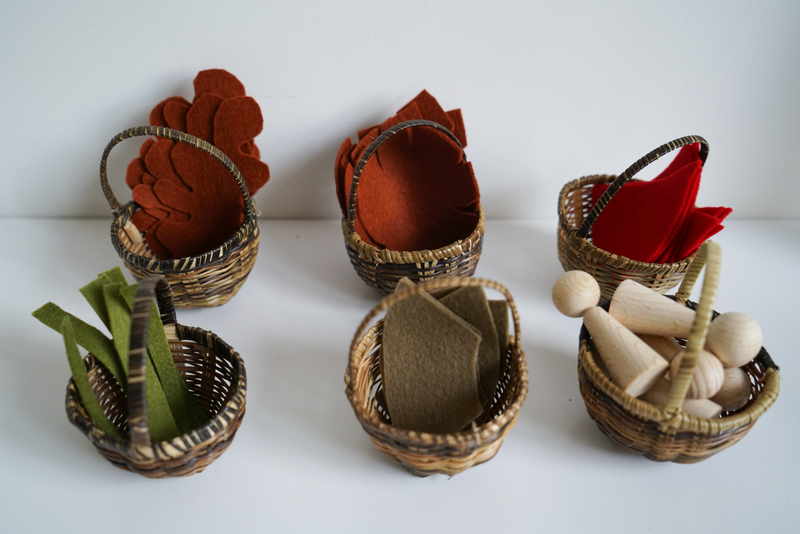 So I bought some tiny baskets, wooden peg dolls (6 cm), some white felting wool and different coloured felt sheets. 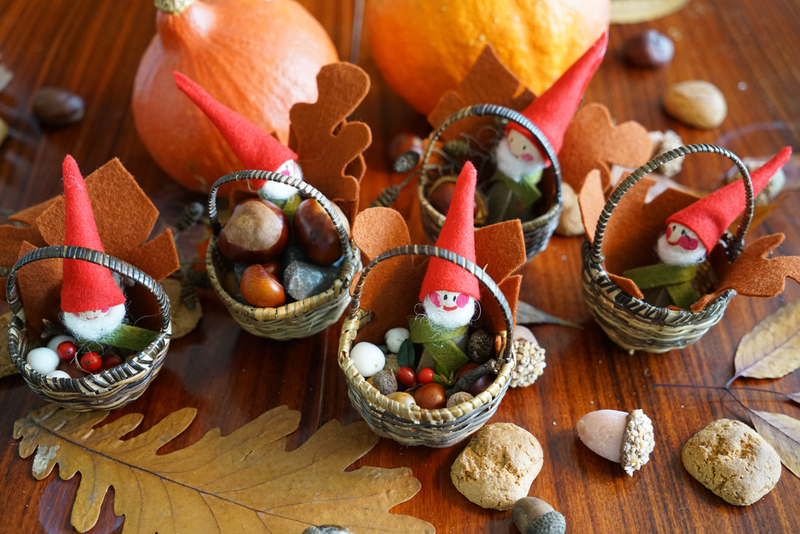 The day before the party I prepared a little autumn gnome basket as an example. 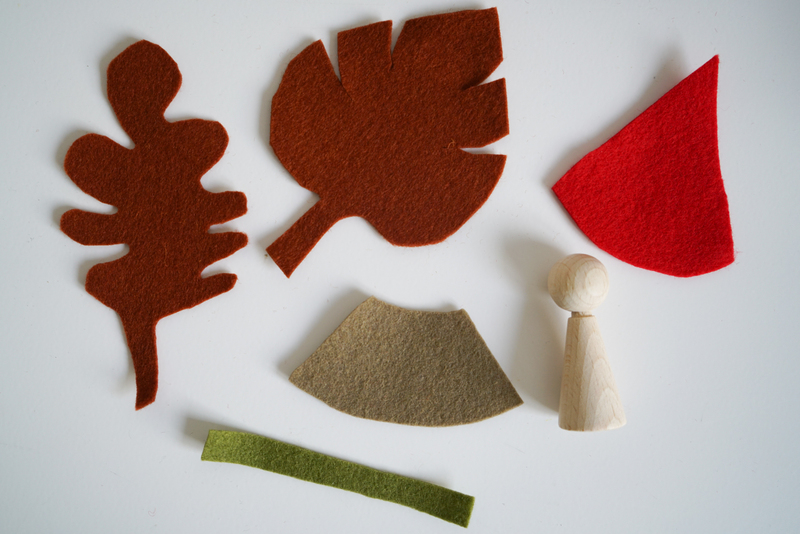 I also pre-cut the rest of the felt (a hat, a coat, a scarf, and two leaves). 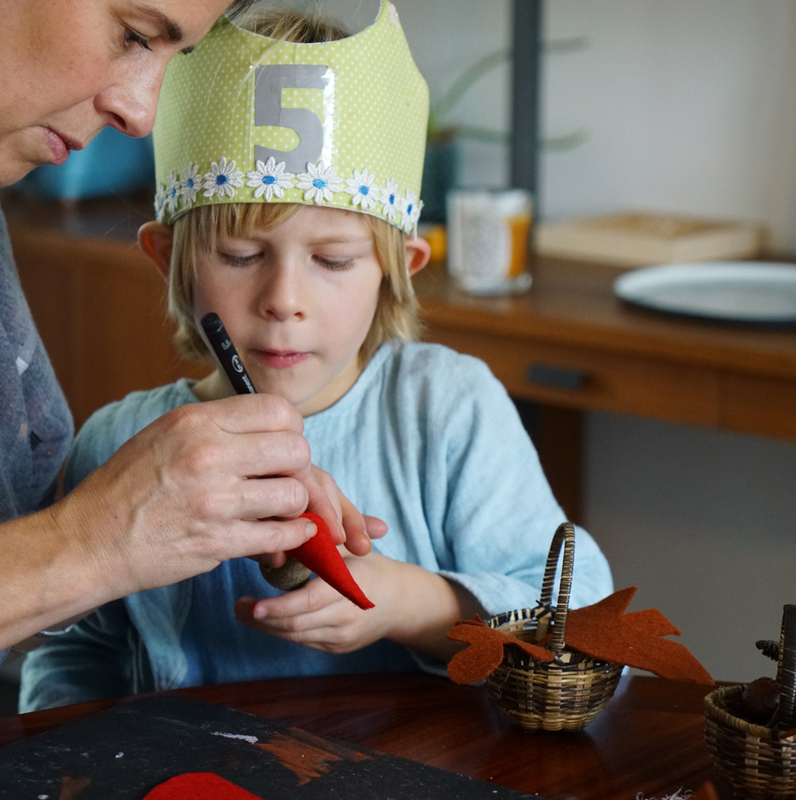 I figured that 5-year-old boys don’t really have the skill and attention span to do this job by themselves… But bigger children obviously can do this all alone! The party decoration itself I kept simple. Just some pumpkins, nuts and leaves on the table, and some marzipan acorns I had found at my local Hema. Plus (it’s that time of year!) some pepernoten as well. I made a carrot cake (my kids can choose between carrot and chocolate and they mostly go for carrot), and decorated the frosting with coloured marzipan branches and leaves and acorns. Look, this is no confectionary work of art, but it turned out quite sweet I think! We first ate cake and opened the presents (which, here in the Netherlands, we do at the party itself). Then, all of the children could come to me one by one and ‘make’ their own autumn basket. I used hot glue to quickly attach the clothing to the wooden peg. I found out that the easiest order of assembly is as follows. First, the children can draw the mouth and fingerprint-stamp the cheeks. (A red stamp pad is handy for this purpose, or you can just use a felt pen.) Then, I glued on the coat and the scarf. 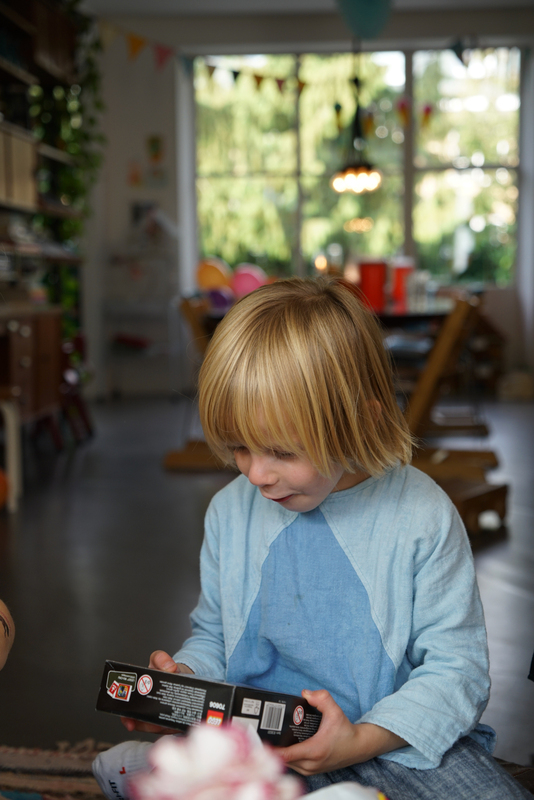 In the meantime, the children can create the beard by rolling a tiny bit of white wool between the palms of their hands. I glued on the beard and the hat (which I cut a bit extra pointy afterwards). The children drew on the eyes as a last step. Then, they can put the felt leaves in the basket and put the gnome in it as well. 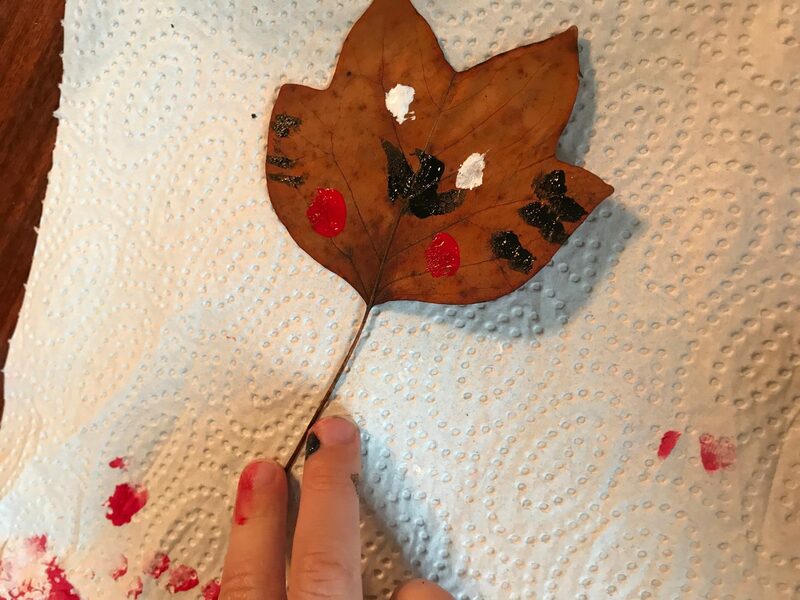 While I was making the gnomes with one child at the time, all of the other kids were painting leaves. Like Casper had done for his invites, so sweet! While the leaves were drying, we went to our local park to play some football. 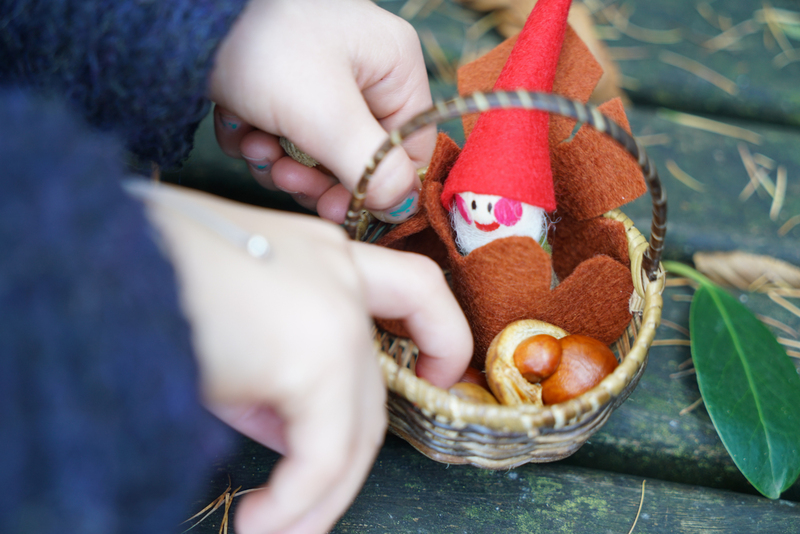 And gather acorns and conkers for the autumn baskets. 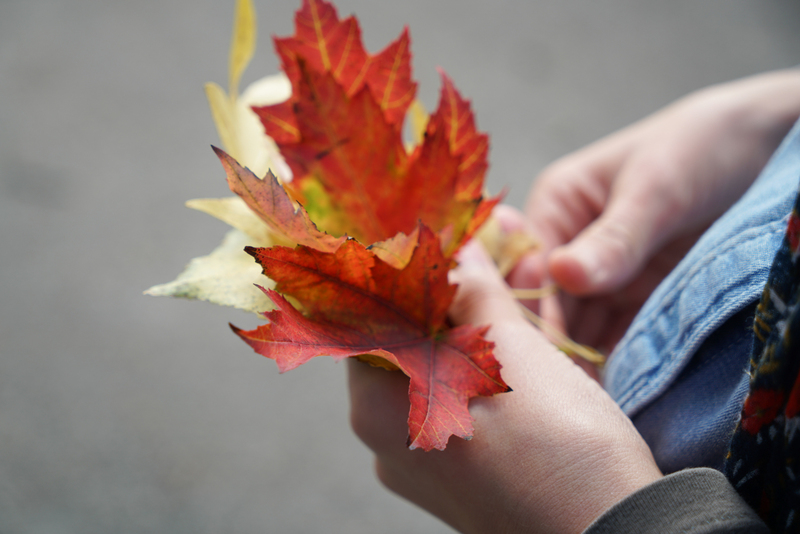 Seriously, autumn is such a beautiful time of year. The colours, and the treasures you can find! Obviously all of the children could take home their little baskets and their painted leaves. Ours have been living on our table ever since, surrounded by pumpkins, leaves and other autumn finds. What a wonderfully sweet birthday for a five year old. We also invite as the number of kids related to the age our kids are turning. I love that the kids took home what they made, the little gnome basket. 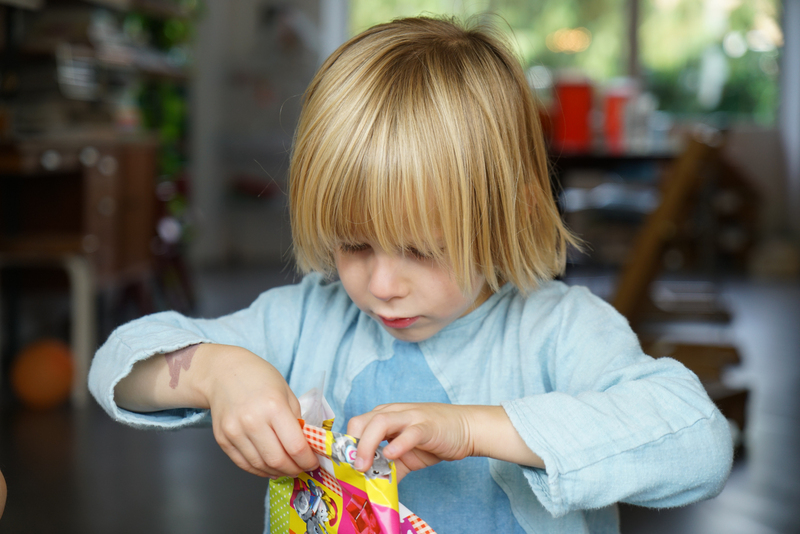 It’s so much better than what happens nowadays with the ‘lolly bags’. Wonderful!